Nearly down to the wire again, but with a day or two left in August, it's time to post some Wayback Nails! This time last year I was just back from the US with a ridiculous polish haul that included some real beauties from Tara and Brandi, two ladies whose fabulousness knows no bounds. Three of those polishes combined to make a glitter sandwich that I absolutely loved, and that's what I decided to revisit. This time, though, I switched it up just a little. I still used the spectacular NOPI Rainbow in the S-Kylie, but the jelly in this month's jelly sandwich is Jaded. Sally Hansen Complete Salon Manicure Jaded was part of my marginally saner Stateside haul this year, and I am so crazy about this minty jade colour! I'd totally forgotten, though--despite reading about it on Amandalandish--that it was a jelly. For daily wear, it's a bit too watery a jelly for me, and drying time was not awesome (I used three generous coats for the base), but for sandwiches, I'm gonna love it. Last year's NOPI Rainbow in the S-Kylie sandwich had two coats of glitter, but that was over a neutral base. This time I went with just one to let more of the beautiful, milky jade colour show through as well. Of course, a final coat of the jelly on top of the glitter, and then I topped with one coat of SV. Loved the end result, and it got a nice compliment from Husband over dinner too! Day two added another gift from Tara, butter LONDON Matte Finish Shine Free Topcoat, which made me realize that I actually did a very similar manicure not long ago. Part of me wondered if I should start over with something else from last August, but honestly, rainbow glitter, matte finish, and a minty base? I'm frankly surprised it doesn't happen every other week around here. I'm such a sucker for this combo! With ice cream for this week's TT theme (and me not quite back up to much nail art yet), I decided it was finally time to wear Deborah Lippmann Rockin' Robin, from the spring 2013 Staccato Collection. Doesn't it look just like mint chocolate chip?! With the name I can also totally see a robin's egg, but the colour is definitely a mintier, lightly greenish blue. Teeny bit of lobstering; great big buckets of me not caring. I just love minty shades so, so much! In addition this polish's super-cuteness, I also can't rave enough about its formula, which is typical DL fabulousness. Two coats were sufficient, but three looked even better. Smooth, even distribution, easy to control, great consistency...even the tiny, black, hex micro-glitter settles nicely into the polish to look suspended without sinking. Sheer wizardry, I tell you! Dotting tool, OPI Suzi Loves Cowboys, Bandi Snow White, and Revlon Cherries in the Snow, done. Now I'm looking forward to seeing what my fellow Twinsies did for this week's ice cream theme! Or possibly, Dress Up Suede 29--I have no idea, but I'm so glad I stumbled across this line! I wore Dress Up's gorgeous gold back in the spring and loved it, and ever since I swatched my first one, the pretty purple, back in February, I've been looking forward to trying it out in teal. Okay, back, and yes, I literally went to go knock on wood. With both hands. Anyway! Totally loved this polish! It's around US$10 a bottle, but the formula is just so, so awesome. Fully opaque in two coats (my three-coat compulsion kicked in, but it wasn't necessary at all), very easy to control, and great drying time. The brush on this one was wonky again, which is a bit disappointing, but just as with the gold, the easy formula overcame the brush without much trouble at all. My photographs might over-emphasize the platinum shimmer just a teeny bit, but as challenging as teal/turquoise can be to capture accurately, I think this is actually a good representation. Like Dress Up's other suede polishes, the matte finish was velvet-smooth to the touch, and combining this finish with teal was pretty much a guaranteed win in my book. Next time I'm in MongKok, I'm definitely going to hit up that little Konad shop for more of these amazing suedes! With a ton of great, new polishes to try, I had no intention of buying any for a while, but The Face Shop Yogurt Nails collection lured me into Colourmix, entirely against my will. I did manage to get out of there with only a couple of polishes, which I thought was pretty admirable...only now that I've tried the first one, it's just a matter of time before I head back for the rest of the collection! This is Vanilla Sugar Yogurt--full name, The Face Shop Lovely Me:Ex Yogurt Nails 02 Vanilla Sugar Yogurt--a polish so cute that it actually managed to cheer me up about my thrice-broken nails! Suspended in a white, jelly base, it has very nearly a complete rainbow of glitter: red, orange, yellow, green, blue, and aqua in both smallish hexes and tiny speckles too. This is three coats, which applied smoothly and evenly, and the bare hint of VNL in these pictures is essentially invisible to the nekkid eye. The glitter spread out nicely all by itself, and a single coat of SV left it beautifully smooth. The Face Shop Vanilla Sugar Yogurt reminds me of so many cute and coveted indie polishes, and I love that more and more brands seem to be paying attention to indie trends.The Face Shop did a great job with this one--yeah, I'm definitely going to be grabbing the rest of the Yogurt Nails collection! I was all excited about my nails FINALLY growing out a little bit again. My latest Stateside haul of polishes has arrived, and I was just doing this one more thing before I took pictures of my nails today...and so of course it happened. I broke that same middle nail. AGAIN. I'm so furious I could...well, I could do some atrociously unladylike things that I'll refrain from describing because my grandmother reads this blog (Hi, Gam!). So, in lieu of the nails I did today, please to enjoy swatches of a great polish I wore a couple of months back; another awesome Nubar, this is Faded Jeans. Nubar Faded Jeans is a beautiful light blue with just a bit of shimmer. The colour itself is actually a little brighter, more pigmented, than I would associate with a pair of faded jeans, but between the pretty sky blue and the subtle shimmer, it's a gorgeous shade. As for the formula, I'm wearing my customary three coats here, which I'd recommend to even out what seemed to be some streakiness, but especially after top coating, that wasn't a problem. If memory serves, Nubar Faded Jeans was released with two other blues, the three of which were good, though not exact, dupes of the popular Chanel Les Jeans trio. This week's TT theme is chevrons, which left the door wide open for nail art possibilities, but since it's still slow going on the nail front for me right now, I decided to stick with a more basic design and do some simple chevron tips. In need of a pick-me-up, I pulled out some of the Halo Hues, which I always, always love. 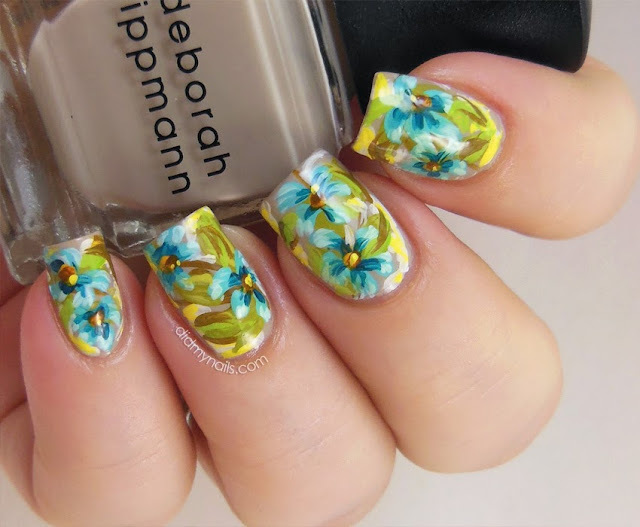 Even without any nail art or embellishment, they're a fantastic go-to choice for when you don't have a lot of time to invest in doing your nails but still want something eye-catching and fun. So yeah, I started with a base of Color Club Miss Bliss, which once again covered quickly and beautifully in two coats, and when that was dry, I added chevron tips in Color Club Beyond. I thought about taping off the tips but just decided to freehand them--surprisingly, given how difficult I find it to draw a straight line, they weren't tricky at all! Fortunately my nails have actually grown back quite a bit, which is a big yay! Unfortunately my bum wrist is making it pretty painful to be on the computer much at all (srsly, I'm gonna have to slap it in traction for the rest of the night and Tylenol up after typing this). Also unfortunately you can still see where I'm missing a good corner of that middle nail. But fortunately again, I have some ridiculously awesome polishes just waiting to be swatched, so I should have some real pretties coming up very soon! Okay, Twinsies, what did the rest of y'all do with your chevrons? Hmm, it may just be the colours I picked, but these chevron tips actually remind me a little bit of hooves...then again, that may have something to do with the fact that I just started watching My Little Pony. Apparently I'm six years old because OMG, LOVE. With my nails (and wrist) in traction this week, I shuffled through my dwindling stockpile of nail pics and came across what was probably one of my favourite manicures yet--and it wasn't even technically finished! Anyway, back from that fascinating derailment, I went on to add a whole bunch of leaves with acrylic paint. I had maybe three different mixes of green next to each other and kept switching them up so that the leaves would have some good depth and variation. The idea was to have a lush jungle or fern-like background to paint some bright flowers on top of, but when I paused to let the leaves all dry, I kinda fell in love with it, just the way it was, and decided to stop right there. Part of the reason I love it so much is nostalgia--it reminds me of that "ivy-covered everything" decorating trend from the mid-90s...and yes, I did just date myself a little bit, so...hey, how about a macro to show off that beautiful Orly Au Champagne? 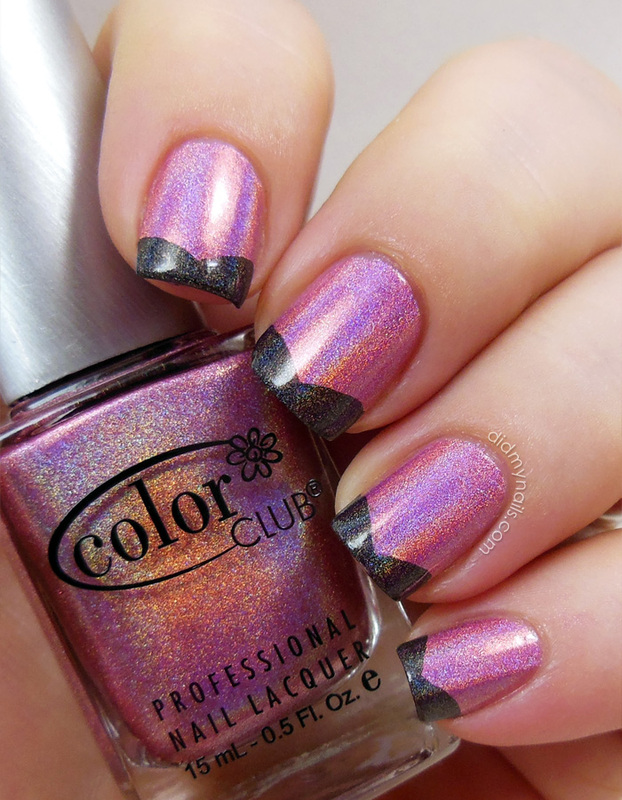 This is definitely one of those polishes I'm going to want to keep a backup of. That soft shimmer is just so pretty! And I can always paint flowers over the leaves another time--just this once it was nice to let the leaves stand out on their own. Yes, I made it back from the States! No, I don't feel entirely human again yet, thanks to some neat-o jet lag that just won't die. Yes, I am so happy to be surrounded by my nail goodies again! And tragically, no, I was not able to buck that horrible tradition wherein my nails break to bits when I go out of town. Within 24 hours of leaving my flat, literally half my nails had broken down to the quick. I spent a month nursing them back to health...only to break my middle nail all over again just ONE DAY before I headed home. Oh, and I apparently have carpal tunnel now, which means I can't really feel half the fingers on my right hand, which makes doing my nails challenging, to say the least. Thankfully, I did this week's Twinsie Tuesday assignment, a circus-inspired manicure, before my trip, and I really liked how it came out! I prefer circuses without animal acts these days, such as Cirque du Soleil, but when I was little, the word "circus" meant Ringling Bros., and Ringling Bros. meant tigers. 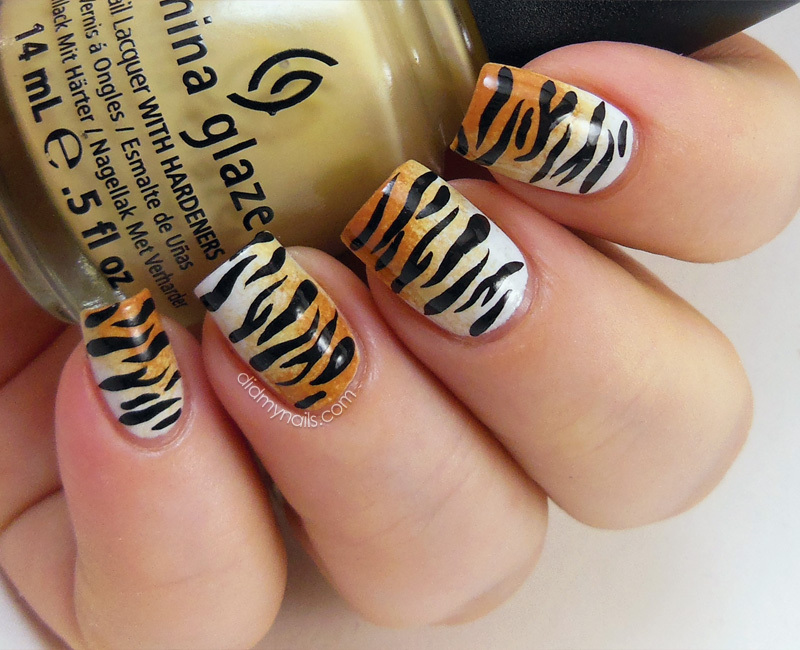 A quick Google of "tiger nails" yielded this great design, which I absolutely had to try. After a base of (what else?) OPI My Boyfriend Scales Walls, I couldn't resist going with polishes from the On Safari collection, so the very roughly sponged gradient uses China Glaze Kalahari Kiss (hey, I used that for my first zebra nails too!) and China Glaze Desert Sun. Once those were dry, I used my Orly Jet Black nail art striper to add the tiger stripes. 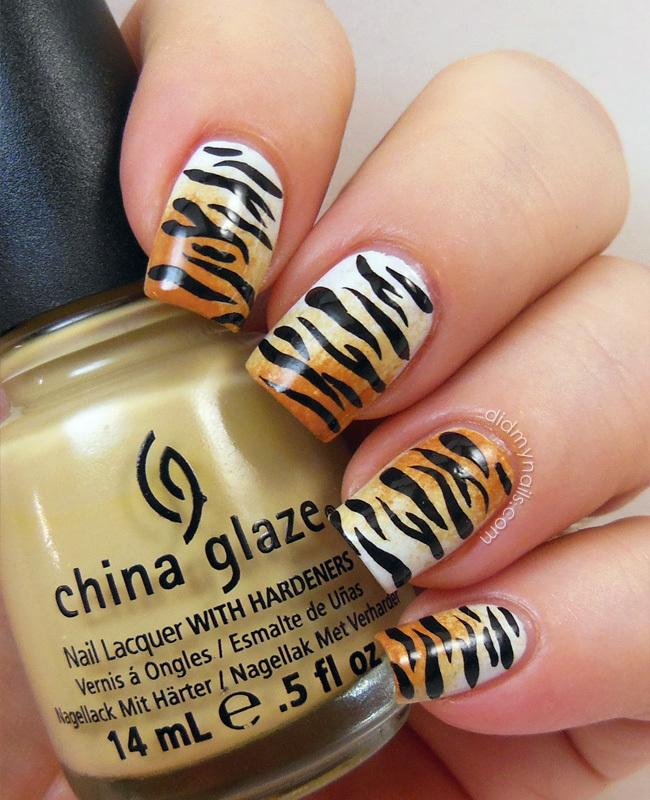 Man, before I went to the States, I knew animal prints were in, but I just had no idea--they were everywhere! Please swing by my fellow Twinsies for more circus-inspired manicures! Also, please wish me some drastically improved nail strength (and wrist strength, for good measure) because I am itching to get back to more nail art! So I was wearing OPI Mermaid's Tears, still giddy about finding it, and while I was ready to change things up a little, I wasn't ready to take it off. Enter Hare Polish Dauphine of Decadence for a layering combination that I don't think I could possibly love more. Dauphine of Decadence, from the Hare Polish Spring 2013: The Last Queen of France Collection, is a gorgeously fine glitter topper. It contains beautiful golden hexes and squares and the loveliest little pale mint hexes, along with a subtle golden shimmer. It's both delicate and glamorous, and this is just one coat--applied normally, even! The fantastic formula flowed smoothy and evenly. No need to dab or fill in. Crazy freaking awesome. The pale mint does fade just a little against the medium seafoam of Mermaid's Tears, but I am cuckoo-bananas about this combination. In fact these are two of just three polishes I have packed to take with me on this month-long trip! I mean, yeah, I'm probably going to buy a bunch more in the States, but that's beside the point, which is as follows: This polish, this combo? TOTALLY LOVE. I'm definitely going to need more Hare Polish in my life! And now I have my fingers crossed so very hard that these posts are all coming up as scheduled. If they are, then I should be on my way back to Hong Kong as this one goes up! I'd love to have a couple more scheduled after this one too in case of jet lag--or in case something happens like it did after my last month away, during which I completely forgot how to paint my nails in a straight line--but, y'know, I'd like a pony too. Neither is looking likely, so my pony-less self will just have to look forward to bouncing back quickly once I'm reunited with my stash and my other nail supplies. And hope like mad that my travel tradition doesn't hold...For some reason, no matter where I'm heading or for how long, whenever I pack a bag and head out of town, I always break at least one nail. Last Christmas took me all the way down to little bitty niblet nails, so please, please wish me luck this trip, and I'll meet y'all back here next month! By which I mean this week. Woooo, time travel! Today's TT theme, a mish mosh of a manicure using a different technique on every nail, is one I was really looking forward to! Unfortunately, time just flat ran out on me before I left town, and I wasn't able to schedule this one before I had to go. 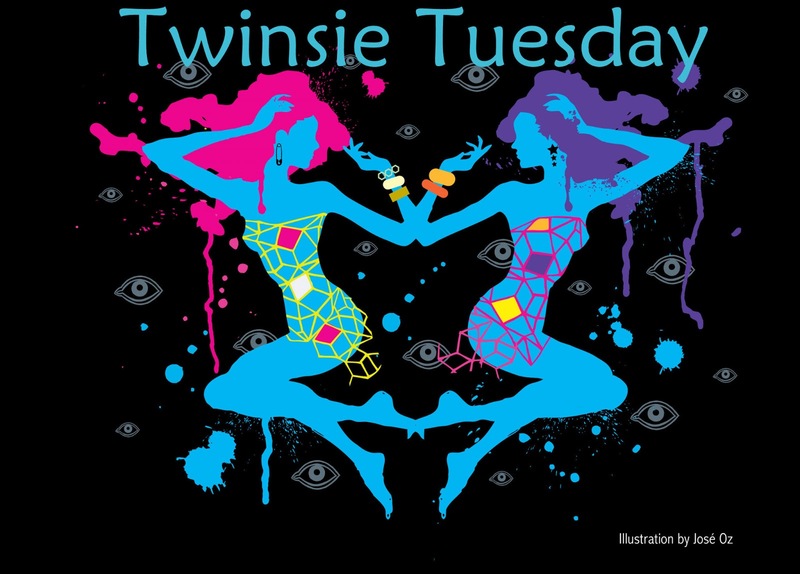 Making it even more disappointing to me is the fact that this week marks one full year since I joined the Twinsies, and I really have loved every minute of it. Enormous thanks to all TT members, past and present, who've made this year so much fun! I *will* do this assignment when I get home again, and in the meantime, please check out some of the other mish mosh manicures! It's been a little while, but I still have a few Color Club Halo Hues I haven't shown off yet--today's is Cosmic Fate, from the second batch...the second batch of what I hope will be many rounds of Halo Hues because I have been loving this entire release. This is actually the third time I've worn Color Club Cosmic Fate. I like it, but I don't completely love it, so I wanted to give it a really fair shake before I decided what to write about this polish. An intriguing shade of orange that I ultimately decided to call "rusted pumpkin peach," Cosmic Fate--like all the other Halo Hues--flares gorgeously in direct light. Unlike the rest of the collection, though, in less direct light, the holo isn't as intense at all. I mean, don't get me wrong--it's still brighter than a lot of holo polishes I've seen. It's just much tamer than the rest of the Halo Hues family, actually looking like more of a shimmer than a holo unless the light was right. The holo may be less pronounced without brighter, direct light, but then again, the colour is so unique for a holo that I think fans of peach-y oranges will be very happy with Cosmic Fate! In some ways I think the shimmery, less intense holo actually goes well with the pumpkin-peach polish, so rather than call this one disappointing--because honestly, we're still taking about an impressively high base level of awesome with the whole of the Halo Hues collection--I'll just say that Cosmic Fate isn't one of my personal favourites, but I wouldn't be surprised in the least to hear that this has been a huge hit with peach polish fans. 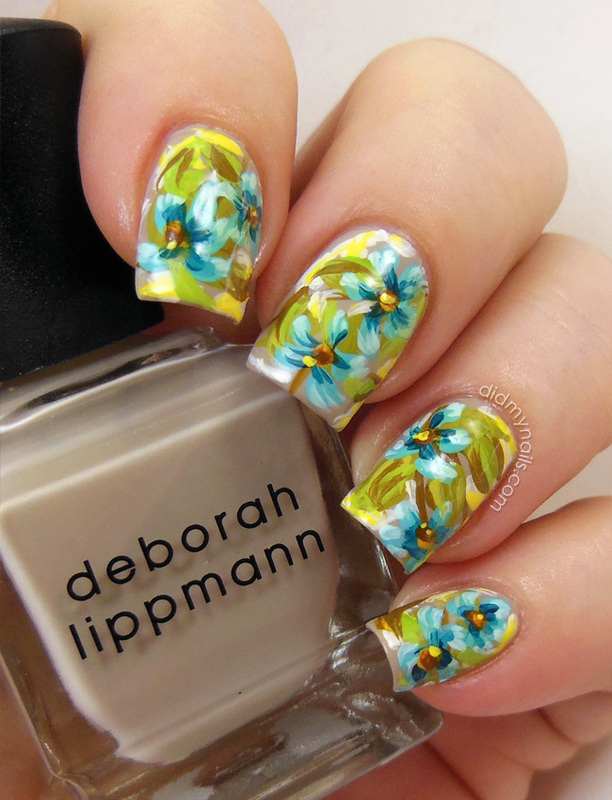 If I were trying to improve my search results I'd probably call this post "tropical flower nail art" or something, but honestly, once these were done, all I could think of was a big, sandal-wearing, frozen daiquiri drinking, Hawaiian flower-print shirt. I really didn't have a plan when I started these--I just laid down a base of Deborah Lippmann Human Nature and then went to town with the acrylic paints. So, note to self, next time I decide to wing it, maybe start with a less precious polish? Just saying. I did some vines and leaves as a backdrop for the flowers, which came out awesomely aqua blue. 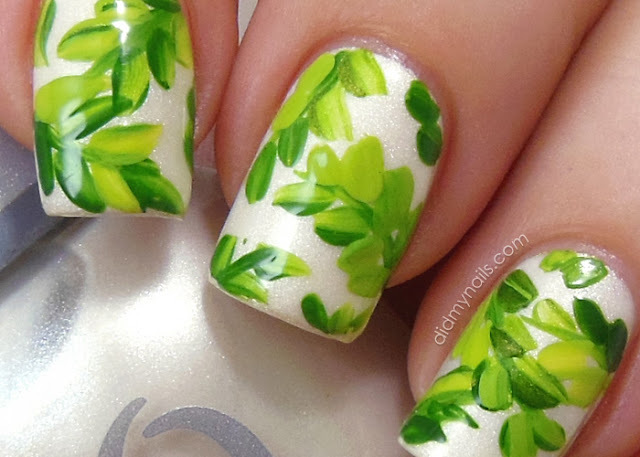 I reeeeally liked the shading and highlighting I got on the petals. Then more leaves happened, and there were swooshes of yellow that may or may not have been bananas...I kept telling myself to stop, but then I kept not stopping, and yet somehow I wound up with something that wasn't a total mess--something I really, really liked a lot! Hopefully I'll be able to recreate something similar when I'm back from my trip in another week or so because these were a ton of fun to do, and I'd love to be able to sport a full mani of these for a couple of days when I have time to relax and enjoy them. Preferably with frozen daiquiri in hand.